Traditional paella originated in the city of Valencia in Eastern Spain. There are many variations that use a combination of vegetables, but the key ingredient that gives paella its unique flavor is saffron. 1. Sauté the onions, peppers and carrots for 3 minutes adding some vegetable broth if needed. 2. Add the mushrooms, chickpeas and seasonings and cook for 3 minutes. 3. Add the rice, quinoa, vegetable broth, and wine (if using). 4. Bring to a low boil, cover, and reduce the heat to medium and cook for 25-30 minutes. 5. While the rice and quinoa cook, prepare the asparagus or green beans separately. 6. Blanch the asparagus or green beans in boiling water for 2 minutes, then drain well. If cooking the asparagus, roast in the oven at 350 degrees F or cook in a pan for 5 minutes. 7. Add the corn and peas to the rice and cover for 5 minutes. 8. Remove from the heat. 9. Arrange roasted red peppers and asparagus on top of the rice and serve. I like to use whole grain parboiled rice for Spanish rice dishes. Uncle Bens whole grain is my favorite. For a more traditional paella taste, you can add ¼ cup toasted nori sheets cut in strips or seaweed seasoning when sautéing the vegetables. Baked tofu is another great addition to this recipe. 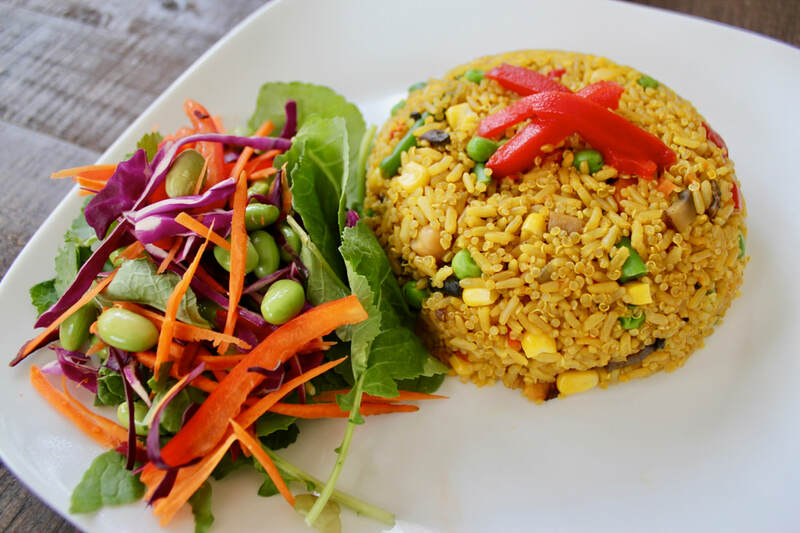 If you have cooked rice and quinoa available, you can create a “Paella Stir-fry” version just sautéing the same vegetables and spices minus the vegetable broth and water.